Our premium wedding chair covers wholesale UK are made of the highest quality Spandex material to ensure your product is strong, stretchy and durable. As an experienced manufacturer of wedding and event fabrics, we know that chair covers need to be versatile enough to fit most standard banqueting chairs while also being tough and long-lasting enough to withstand regular use. 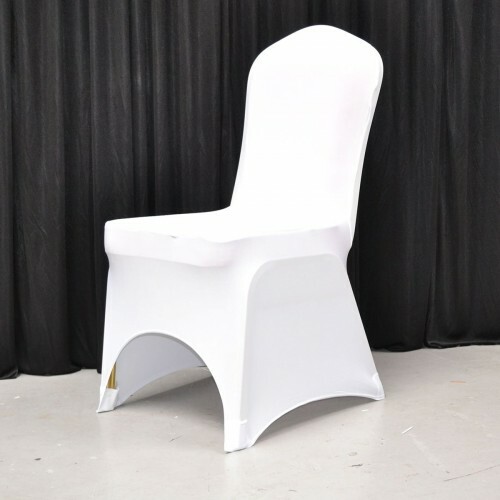 These 220GSM lycra chair covers are ideal for event planners and venue decorators, since they have the strength to be used again and again while remaining low maintenance. Our universal Spandex chair covers can be purchased in bulk, making them a cost-effective choice for large-scale events and weddings. The material can stretch four ways and is free from seams, so that you can appreciate the most attractive finish on most-sized chairs, no matter their shape or style. These Spandex covers are secured in place with elastic leg pockets, which are reinforced to allow for constant dragging along the floor as people get up and down from their seats. When the event is finished, and the covers have been removed from the chairs, the low-maintenance cloth is machine washable and unlikely to crease, so that there is no need for ironing between events, saving you both time and money. As the largest wholesalers of Spandex chair covers in the UK, we are able to offer excellent prices for bulk purchases, helping to keep overall event costs down. We provide next day delivery for most postcodes – perfect for last-minute changes in theme or colour. Whatever the occasion, these stunning chair covers are a simple way to add a touch of elegance to a room. They look extremely chic on their own, or you may choose to adorn them with bows, sashes, bands or buckles. Take a look at the other products on our website for inspiration!